UK based dspdesign has launched a computer that does not need a separate power cable. The computer can be powered solely by a single CAT5 Ethernet cable. 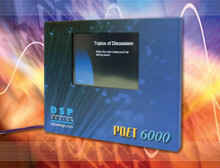 The new model named as POET6000 uses a flat panel for display. IEEE802.3af Power over Ethernet technology allows the system to use a single cable for both power and data, allowing economical, flexible installation by network engineers.